20% Discount for early registration. Download the registration form now to reserve your place, or use the contact form below if you have questions. ASI Consulting Group, LLC offers this course to help professionals like you achieve tremendous results from Robust Engineering and Robust Optimization methodology. This 2-Week Intensive study will prepare in-company leaders to implement robust engineering culture throughout the organization. The courses will offer answers to these and other project management questions. How to improve robustness using low-cost variations of a single, conceptual design? How to speed up product development cycles with FEWER manufacturing problems? What’s the secret of fewer field problems, lower-cost and faster product launch cycles? What is System Behavior Testing (SBT) and how does it help define the fewest number of tests with the most amount of coverage? 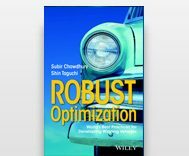 Is Robust Optimization for you? Download the registration form now or use this contact form and someone will respond as soon as possible.